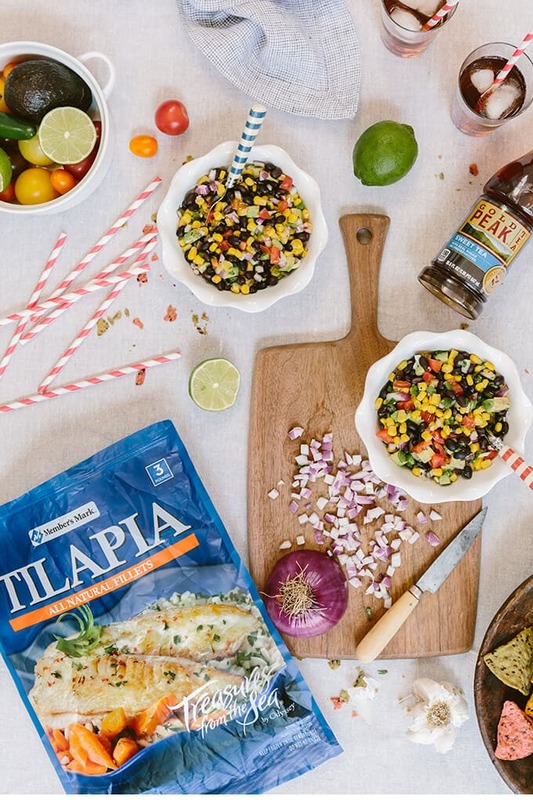 Healthy Baked Tilapia with Black Bean Salsa is a flavorful, quick and effortless recipe that is perfect both for busy weeknights and for summer occasions. This is a sponsored post written by me on behalf of The Coca-Cola Company. All opinions are 100% mine. If you ever ask me whether I have a back pocket recipe for unexpected guests, here it is: This Healthy Baked Tilapia with Black Bean Salsa. It is ready in minutes and doesn’t require any effort at all. As it is oven baked, you don’t have to clean the whole kitchen, no mess of frying. With the dressing I use when baking, nobody misses fried fish. Do you have life-saver foods in the freezer so that you can use to prepare a quick dinner for your family or guests? 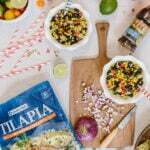 Besides lots of corn and berries I store for myself every summer, Member’s Mark Tilapia fillets are a staple in our freezer. I make a quick tilapia recipe and serve it with a refreshing salsa whenever some guests come over for dinner and I have little time. Last weekend, when my husband came home with two of his friends at dinner time, I could have got angry if there hadn’t been anything in the freezer. Thankfully, it wasn’t a big deal for me. I made this Healthy Baked Tilapia and served it with a simple black bean salsa. I can proudly say that everyone loved it so much. They told me that it was way better than any fish they had eaten out. Did I tell you how easy it is to make this recipe? I covered the tilapia fillets with an olive oil and lime dressing which gives them a nice fresh flavor and keeps them moist. I can’t think of anything worse than a dry fish, so olive oil and lime juice are great to prevent the fish from drying. Unlike most of the fish recipes around the web that call for butter, this one was made with olive oil, which is undoubtedly healthier with less calories, yet just as tasty. Finally, to give the fish some more flavors, I added garlic powder and black pepper in the dressing. As a result, the flavors on the fish matched perfectly with the black bean salsa. Seriously, this has been our ultimate fish recipe for a long time because whoever eats it feels pleased. I mean no recipe can go wrong with this super compatible lean white fish, so it’s a good idea to store some in the freezer for later use. What I love about tilapia is that it is a very low-fat fish with lots of health benefits and can be paired with various foods depending on your taste. I made an easy black bean salsa that is packed with summer flavors to serve with this oven baked tilapia. Some more healthy stuff on my healthy baked tilapia. Black beans paired with corn, avocado and tomatoes look great when served on the tilapia fillets. Lime, garlic and red onion are must in a good salsa recipe for me and this one is not an exception. Adding jalapeno pepper takes this refreshing salad to the next level. Another thing I love about tilapia is that you can easily find it at the market and it’s quite affordable when compared to other fish. 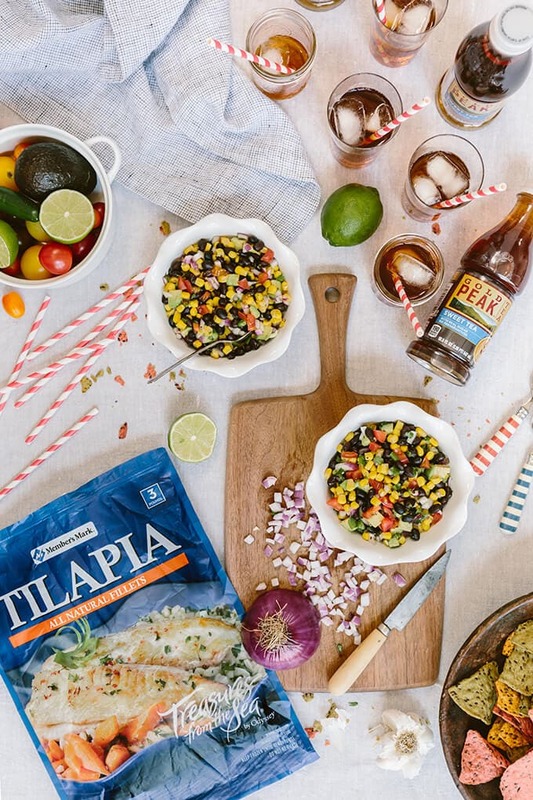 When you have little time to prepare dinner for a special occasion like Memorial Day or Independence Day, go buy some Member’s Mark Tilapia from the closest Sam’s Club and give this recipe a try. ● My tilapia fillets were large, so I cooked them for 10-11 minutes and they were nicely flaky. If yours are thinner, cook them a minute or two less. 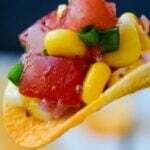 ● I use fresh corn in the salsa, but you can use frozen or canned then you don’t need to cook it. Defrost it if you use frozen, rinse and drain if you use canned. ● Leave jalapeno out from the salsa recipe if you are planning to serve the meal to kids. Summer dinners need a good cold drink. 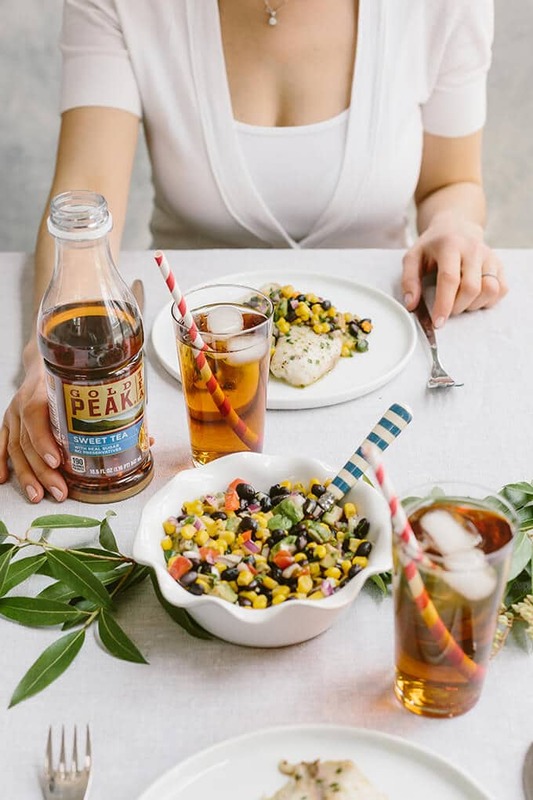 Everything gets more fun when you have crowd-pleasing beverages on the table to complement Healthy Baked Tilapia with Black Bean Salsa. When you don’t have time to prepare it yourself, you need to buy a good one. It has a nice home-brewed taste, so I think Gold Peak ® Tea fits the bill perfectly. Serve it with lots of ice and double your joy! A flavorful, quick and effortless recipe for weeknight dinners. Pre-heat the oven to 425 F degrees. Make the dressing by whisking together the olive oil, lime juice, garlic powder, salt and pepper in a bowl. 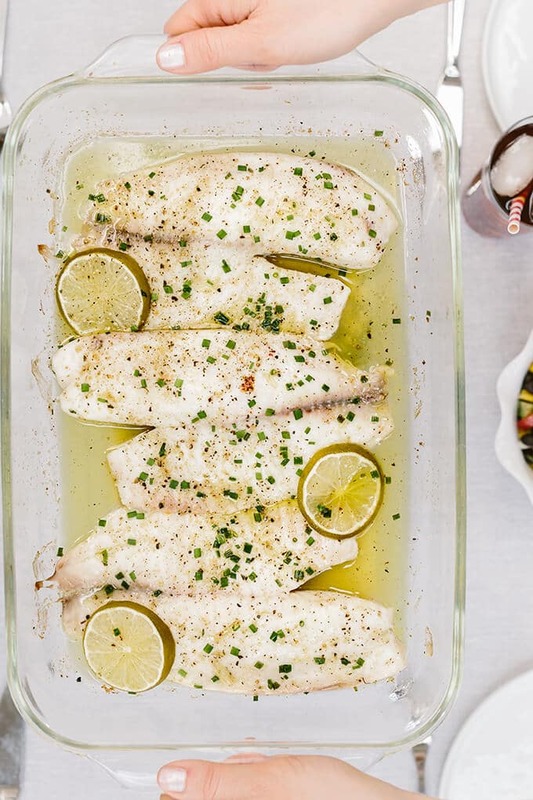 Place the tilapia fillets in a large (mine was 9X13) oven-proof casserole dish. Drizzle them with the dressing. Garnish them with slices of lime and chives. Bake 10-12 minutes or until fish flakes easily with a fork. Bring a small pot of water to a boil. Add the corn and cook until tender enough, 3-5 minutes. Drain. Mix together all of the ingredients including corn in a bowl. Place each fillet on a plate, garnish with the salsa and serve.